Even if the rest of your life is a hot mess, at least your car won't be. If you’re like us, you occasionally treat your car's glove box or console like a mobile junk drawer. Just stick anything you don’t immediately need in there and it’s out of sight, out of mind, right? That is until it comes time to find your vehicle registration and you're digging through crumpled up receipts, loose change and old packs of gum to retrieve it. Thankfully, there is a better way. Whether you have a job that requires lugging around a lot of paperwork or you just want to keep your vehicle more organized, these 3 inexpensive yet brilliant glove box organizers will do the trick. The High Road Glove Box Organizer ($13) is like that one coworker who color codes everything with Post-its and swears by her trusty file cabinet. The only difference is that this handy tool won't judge you for your own disorganization. What it will do, is ensure you can find the important items like your car manuals, insurance cards, and those receipts you need to submit for reimbursement. This organizer comes with 6 pockets to keep documents of all sizes neatly tucked away. You'll find 5 inside pockets and a zippered outside pocket for the items you need to access quickly and frequently. Another handy feature is that the High Road organizer comes with a pen and notepad holder so you won't be scrambling next time you need to jot down a phone number or reminder while in your vehicle. The last thing you want is for your car to start resembling your teenager's bedroom. The PlusXpres Glove Box Console Organizer ($18) will make sure that doesn't happen. It is the car organization system you didn't know you needed in your life until you get it. It's so simple, yet it instantly solves all your messy car woes. You'll score 5 interior pockets to file away manuals, a AAA card or business cards. Interior and exterior loops hold pens, USB cords or tire gauges. There are a couple of features that made this organizer stand out. Firstly, the PlusXpres is built to last with durable materials like high-quality polyester and a heavy-duty, tear-resistant structure. As an added bonus, it comes with an auto log book which lets you log fuel, trips, maintenance, and notes so nothing slips through the cracks. 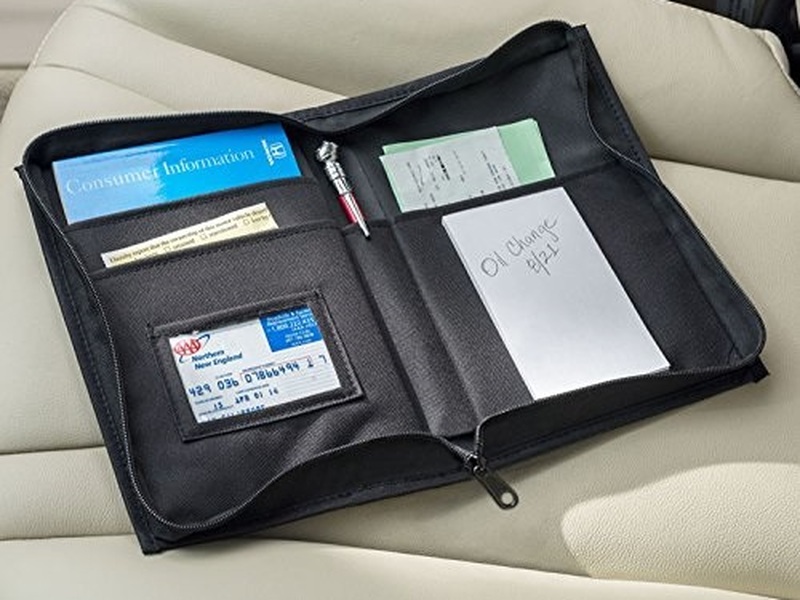 The SHIMDU organizer ($17) is a stylish, oversized wallet for your vehicle. Made of polyurethane black synthetic leather, it is durable and water resistant to protect your important documents from moisture. The compact size of 9" x 7.3" means you can organize your stray papers and cards while also leaving room for other accessories in your glove box. The inside of the SHIMDU features two clear sleeves for documents you'd like to keep visible and a larger pouch that fits a small tablet. The organizer comes with a 2-in-1 pen that can work on a notepad or electronic device once you flip it around to the fiber mesh tip. This glove box sidekick is equally attractive and functional.